Do you know how to graft? Have you tried, but had mixed success? It’s not difficult, but has lots of aspects to it, and is one of those skills (like pruning) that needs practice to cement the theory. We love it when people who have been to our workshops get back to us to let us know how they went, like this note from Judy, who came to a recent budding workshop. If you haven’t heard of it before, budding is the type of grafting we do in summer, and it’s pretty easy. The technique is as simple as taking a single bud from the desired variety, and inserting it under the bark in the graft recipient tree, or rootstock. 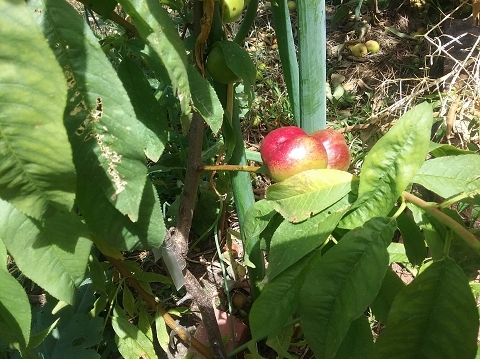 It’s interesting that Judy sent us a photo of her nectarine tree, because though budding can be used for all fruit trees, it is the only type of grafting we routinely use for peaches and nectarines, as they tend to be very ‘gummy’ and the more traditional winter grafting techniques don’t usually work, as the big cuts that are required stimulate the trees to respond with a lot of sap, which prevents the graft from ‘taking’. Grafting is literally thousands of years old. It was known to be used by the Chinese before 2000 BC. It is one of the basic life skills that underpins our food security because it’s what turns a rootstock or seedling (which may not have good fruit on it) into a known “variety” that will bear reliable, high quality fruit. Unfortunately it’s almost a lost art, and hardly anyone knows how to do it any more. We’re on a mission to teach as many people as possible these skills, because if you know how to graft, and you know how to grow your own fruit trees from seed or cutting (which we also cover in our workshops) then you have the skills at your fingertips to create an endless supply of fruit trees for free for yourself, your family and friends, or even as the basis of a small business. Tape it up to seal it while the graft heals. If you’re intending to transform an entire tree to a new variety, then you need to do some preparation work in early spring. Remove most of the limbs from the tree and the tree will respond by growing a forest of new shoots to replace the limbs that have been removed. 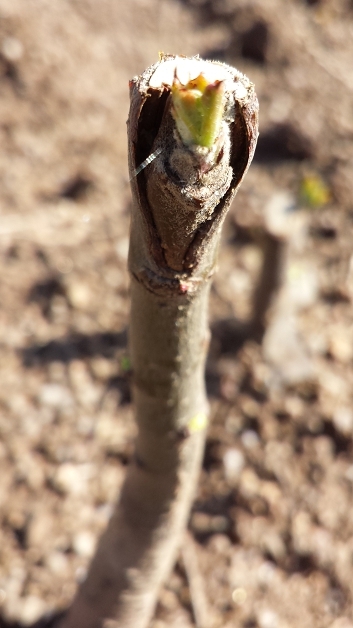 When it comes to budding time, select the shoots that are in the right place to create replacement limbs and bud them, removing all the other shoots. We love passing these skills on to a whole new generation of food growers and have developed a short online course that includes theory and videos — you can access it here. Previous Previous post: Why are my apples brown inside? Next Next post: Do wind and fruit go together?